In a move potentially akin to fiddling while Rome burns, I have passed a pleasant number of hours today waiting for the results of the South Carolina Primary up to my metaphoric elbows in Midi signals. 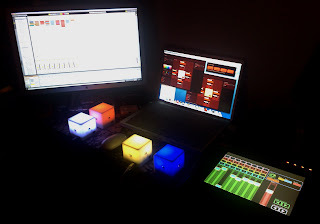 Although I have used my Lemur before to control Ableton Live, I hadn't found the time to set it up with my Audio Cubes, as that would require a whole heap of manual midi mapping. The Audio Cubes are amazing, essentially each matched pair have a wireless connection, and depending on their physical proximity and orientation to each other a specific midi signal is transmitted. A typical set-up in Live would trigger a specific loop as one cube was rotated in relation to another, presenting a new face. The cubes also receive data back from Live, pulsing or changing colour according to the tempo. As with the Lemur I had used the Cubes before, but never in conjunction with another controller, and when I finally got around to doing so today more fun was had than in a long, long time. The Lemur was mapped to individual track volume controls, a number of effects, start/stop commands as well as a triggering a few loops, but the bulk of the loop controls were handled through the Cubes. Very tactile, more like playing an instrument and giving a much more gratifying experience than hitting keys on a keyboard. All of which kept me occupied for long enough to see 15% of the votes tallied in the Primary and 54%(ish) share of the vote for Obama, a lead he is unlikely to loose between the time I go to bed and when I wake up tomorrow morning.